Dominic Grey is back on another adventure with his boss, phenomenologist and cult expert Viktor Radek. This time they're investigating the murder of a Satanic priest who is burned alive by a robed figure who seems to appear and disappear before the eyes of several witnesses. When other religious leaders begin receiving letters from the murderer, condemning them to a similar death, Dominic and Viktor are determined to uncover the truth before more deaths occur. 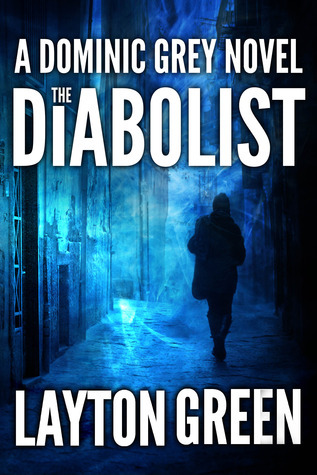 The Diabolist by Layton Green is the third book in the Dominic Grey series and the first to be published under Amazon's Thomas and Mercer imprint. The first two books were also re-released this summer, and I'm not surprised the series was picked up. It's a unique series that delves deeply into religious cults in a detailed yet objective way ~ and there's always plenty of suspense and excitement to keep the pages turning! In The Diabolist, Green tackles Satanism, and with it, the whole concept of evil. I found this absolutely fascinating and it really made me think. His stories also make you realize that whether what someone believes is actually true or not doesn't always matter; what matters most is whether they absolutely believe it is true. If they believe enough, they can almost make it real. As with the first two books, there is a lot of action but also a lot of thoughtfulness throughout the book. Dominic and Viktor have to fight for their lives many times, but there's plenty of time for introspection as well. There's also plenty of magic and mystery in this one. I have to say this is probably my favorite of the three books so far. And it really does stand alone, so if you're looking to try the series, you can start with the first one, The Summoner, or just jump in with The Diabolist. If you enjoy thrillers that make you think, I highly recommend the Dominic Grey series. This review was written based on a copy of The Diabolist that I received from the author in exchange for an honest review.